As the State Bar begins to tackle 7,000 warehoused complaints against its members, early indications are that it will pursue far fewer cases than in the past, focusing almost exclusively on the most serious matters. With significantly reduced funding and staffing levels far below what they were in the discipline system's heyday, the bar simply can't do what it did before Gov. Pete Wilson vetoed its dues bill in October 1997, a move which ultimately led to the near total shutdown of efforts to police California attorneys. On the other hand, a revamped system which established priorities and created teams of prosecutors and investigators will likely crack down on the most serious offenders even faster while removing lesser misconduct from the system almost completely. "We've raised the bar as to what we'll send to enforcement," said Paul Virgo, assistant chief trial counsel in charge of the discipline system's intake unit. "We have fewer but better cases to investigate and prosecute. "The downside is we don't have the ability to do minor misconduct matters." 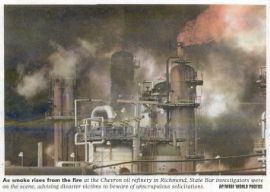 Within hours of the March 25 explosion at a Chevron Corp. oil refinery in Richmond, representatives of the State Bar went to local hospitals to warn patients about improper solicitation by attorneys. Three attorney were asked to leave Doctors Medical Center in San Pablo when they showed up after the accident. Several weeks after the incident, however, bar officials reported no evidence of misconduct. It is unethical for attorneys to solicit clients at hospitals, and they may be subject to discipline for doing so. Information provided to persons seeking medical attention advised them of their right to seek legal advice in the wake of the explosion. Although interest rates on client trust accounts have rebounded slightly in recent years, a drop in the rates in December signals a possible reduction in grants to legal services programs in California next year. As a result, the State Bar's Legal Services Trust Fund Commission has begun to pressure banks to increase interest rates on those interest-bearing accounts. Continuing education requirements for California attorneys would be reduced by about one-third under a bill introduced last month to fund the State Bar. SB 144, by Sen. Adam Schiff, D-Pasadena, also sets dues at $395 for all attorneys, imposes no subject matter restrictions on bar lobbying and technical assistance, and offers a hardship fee for lawyers whose incomes do not meet a minimum level. In addition, the measure boosts to $4 the amount attorneys may deduct from their mandatory dues to fund advocacy outside the parameters of the Keller decision. State Bar President Raymond C. Marshall said he was "extremely pleased" with the Schiff bill, which he and other bar officials have been negotiating for months. "It should garner partisan support because it really addresses all the issues and concerns which have been raised over the last two years regarding the bar being more streamlined and responsive to our members," Marshall said.